This week we are going to dive much deeper into the German plans for their attack at Verdun. The attack would be planned for two phases, the first phase the attack at Verdun and then the second phase was the counter attack to a British or French relief offensive. We will also talk about why on earth the Germans would attack Verdun and more importantly the geography and fortifications around Verdun which made it such an imposing target for an army in 1916 to try and attack, let alone make any progress. Map of Verdun and its surrounding fortifications. Last episode we looked at what Falkenhayn's mindset was going into 1916, why he planned on attacking in the West, and what his overall goals were. We also looked at the allied plans and how the upcoming action at Verdun would greatly disrupt them. This week we are going to dive much deeper into the German plans for their attack at Verdun. The attack would be planned for two phases, the first phase the attack at Verdun and then the second phase was the counter attack to a British or French relief offensive. We will also talk about why on earth the Germans would attack Verdun and more importantly the geography and fortifications around Verdun which made it such an imposing target for an army in 1916 to try and attack, let alone make any progress. This is just the second part of our 13 part series on Verdun so hopefully you have listened to part one last week and you are in this for the long haul. Verdun was an old town, it had been founded by the Gauls back in ancient history and it had been the site of many battles over the millenia. In the centuries before the war the French had put a lot of time and money into defended the area. The creation of the fortifications that were present in 1916 started in 1870 and the Franco-Prussian war during the Franco-Prussian war it had been besieged by the Prussian invaders but had held out longer than any other fortification in France. After the war the French took stock of their frontier fortifications and decided to drastically improve them, and Verdun was one of the sites that would have the most work completed. This period of fortification, at its height when the French strategy for a war was highly defensive, would not be as well known as that of a few generations later and the creation of the Maginot line, but it was still a huge undertaking. Over the period between the Franco-Prussian the first world wars there were 500 forts and 278 prepared and protected artillery emplacements constructed. The largest of the forts were designed to withstand sieges of days or weeks but they were not designed to be able to hold off whole armies forever. The general idea was that they would present enough of a problem for attackers that they would be funneled into specific invasion corridors where the French army would be prepared to meet them in battle. In fact, contrary to what you might expect some relatively each invasion routs were left unguarded specifically to funnel armies down them. This was at a time before the first world war, when it was proven that an army could, with enough men, fortify all of France, so the French just wanted to know where the Germans would go, not necessarily stop them from going somewhere. The geography of the region around Verdun greatly assisted in the goal of creating some sticky obstacles for enemy armies. There were concentric ridges all around Verdun that in themselves acted like natural walls. On these ridges would be placed the fortresses and other smaller fortifications. The construction of these fortifications was at its peak soon after the Franco-Prussian war but would continue all the way up to 1914. By the start of the war there were 20 major and 40 intermediary forts on the map of Verdun. Some of these would become famous, Douaumont and Vaux being at the top of the list but also Moulainville, Souville, Tavannes, St. Michel would play a role in the fighting. All of these fortifications were placed so that they could find upon the attackers of the other. All of the fortresses were not built at once though, it took decades, and during that time artillery would increase in capability, so the new forts would be better and the old forts had to be updated. This meant that when the war came, especially after several years of the French military being under the strong influence of offensive minded generals there were some forts that were far more capable than others and at the top of that list was Douaumont. It was the largest and strongest of any of the forts at Verdun and it was located 10 kilometers northeast of the city and had an elevation of 1200 feet. The fact that it would change hands twice with very little fighting is quite the irony. How these fortifications were built, and how they were protected ends up being pretty important during the action at Verdun and the most important aspect was that they were mostly underground. These were not medieval castles, by 1914 the fortresses had so much concrete and earth on top of them that the only thing visible were the gun emplacements. This method of having concrete, and then a layer of earth and debris, and then more concrete would prove to be very successful against even the heaviest of the German guns. This also meant that there were a labryinth of corridors and storage rooms and barracks underground which would be the scene of fighting during the action at Verdun. These were usually lit by electric lights, which were often the first to go during an attack, so many of these actions were in the pitch black darkness. The attackers navigating through a maze of twists and turns, which were of course never the same from fort to fort and always a closely guarded secret, and the defenders just trying to survive. One of the problems that the architects at the time were trying to solve was how do you allow the fort to still have guns without them compromising the integrity of the forts defenses. This was important because the forts were designed with the primary goal of being protected stationary gun platforms and as artillery observation points. But the only way for guns to fire out of the forts was to put holes in all of that concrete that was just poured to try and defend from enemy artillery. 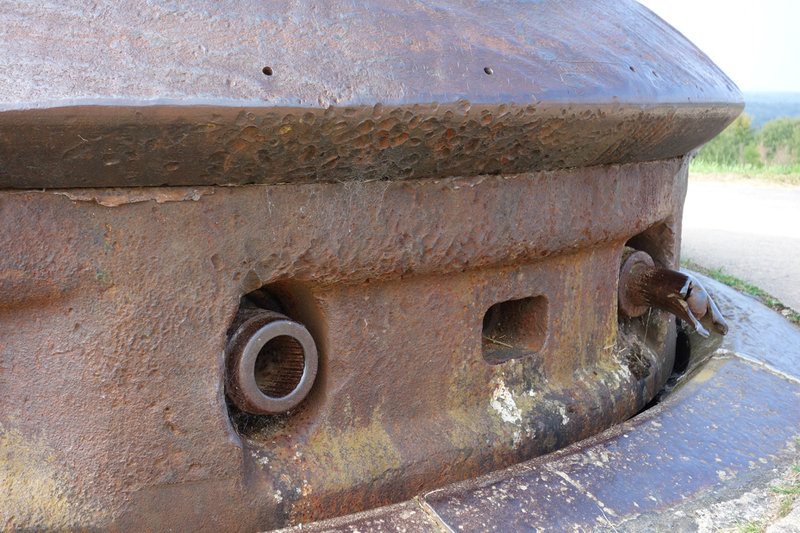 The solution to this problem that the French landed on was the retractable steel gun turret. The turret had a hard steel covering that would protect it when under fire and it was retracted. When the gun was retracted this was the only part visible from the surface. When it was time for the gun to fire the turret could then be raised and after the gun fired and reloaded, or lowered again if the enemy started firing. This was a great solution, but it was not perfect, turrets were complication, expensive, and most importantly heavy and this meant that they could only be so large. Another problem was that to raise and lower the turrets the guns had to completely fit within the turrets, the barrels could not stick out at all. Put these two problems together and you end up with the result that the guns that went in the turrets could not be normal sized guns, they had to be modified. So, the 75mm and 155mm guns in the turrets had their barrels shortened to allow them to fit within the turrets, which were as large as they could be. This meant that the gun ranges were reduced significantly but at the time this was not seen as a huge drawback. When the forts were constructed the only weapons that could threaten the fortifications were siege mortars which had a very low range, this meant that as long as the guns in the fort outranged the mortars they were more than acceptable. This would not be the case in 1916, but by that point it was too late to try and do anything different, and the guns would have to stay as they were. When war came to Verdun in 1914 the French third army had been able to hold off a number of German attacks. The city had almost been surrounded but this was barely stopped and it resulted in Verdun being at the end of a narrow and deep salient pointing out into the German lines. By the end of 1914 and in 1915 the strategic importance of the area had decreased greatly as fighting had moved elsewhere and the terrain was not conducive to the type of breakthrough offensives that the French were hunting for at the time. The Germans had launched a few attacks during 1915, most of which were small, to try and pinch off the Verdun salient but they were not very successful and they were considered failures. By 1916 the town itself was mostly empty, with 80% of the population having left in the first year and a half of the war. However, this did not mean that it was a dead city. In fact there were many new businesses in town that had been created to meet the needs of the French soldiers stationed around the town. This meant there were actually more grocers and restaurants in Verdun than there had been before the war started. Before 1916 the French soldiers even considered Verdun to be a nice quiet sector where they could relax in relative safety. So with this de-emphasis on the French side, it can, and probably should be asked, why Verdun was chosen by Falkenhayn as the point of attack for the beginning of his grand offensive. As I mentioned before it was not a great spot for a decisive breakthrough or a great offensive victory, the geography almost entirely ruled that out even without all of the pre-built offensives. In fact, once the attack really got going Joffre and the French leadership were initially more than willing to retreat behind the town. In some ways that would have drastically improved the French situation, there were ridges and hills behind Verdun that were easily defendable, and they would not have been surrounded on 3 sides by German artillery. But, the civilian leadership stepped in and they had serious concerns about abandoning the city. Verdun was pretty well known in France, it was not some random hill out in the eastern part of France, it was probably in the top 5 list of places in France in terms of name recognition. Because of this the government could not allow Joffre to give up the city without a fight, if that happened the government would probably be overthrown and another one brought in to replace them. Falkenhayn was counting on this reaction from the French, he sort of built his entire plan around it. There were some positives on the German side for attacking, the sector had been largely quiet, and this meant that the French defenses, other than those big forts, were not the best engineered or manned, with the French soldiers considering it an easy rotation point in the line the defenses in the area, outside of the front line, could be described with the word neglected. And then there was the fact that it was a salient pointing out into the German lines which allowed for that three sided artillery attack to be launched, there would be nowhere that the French soldiers could hide, compacted down inside their small area surrounded by enemies. It was also an easy win for Falkenhayn with the Kaiser because it would be none other than his son, the Crown Prince, that led the German Fifth army that would be responsible for the attack. After Falkenhayn had obtained the Kaiser's permission for the attack the planning began in earnest during discussions between Falkenhayn, the Crown Prince, and his Chief of Staff General Knobelsdorf that began in December. The relationship between the Crown Prince and Knobelsdorf, who was technically his subordinate was an interesting one. Knobelsdorf had been the Crown Prince's military tutor earlier in life and therefore exercised a huge amount of power within the German Fifth Army. It was because of this relationship that Knobelsdorf had gotten the job in the first place, he was well liked by the Kaiser and he had seen it as a way to give protection for his son who did not have a great amount of command experience. As the situation at Verdun would progress it would become very clear who was leading the Fifth army, and it was not the Crown Prince. The Crown Prince was initially excited for the role that his troops would place in the upcoming attack, when he learned of the Fifth Army's role he would say "My long suppressed eagerness to lead my tried and trusted troops once more to battle against the enemy was now to be gratified. I was filled with happy anticipations; yet I could not regard the future with a confidence altogether serene. I was disquieted by the constantly repeated expression used by the Chief of the General Staff that the French Army must be 'bled white' at Verdun, and by a doubt as to whether the fortress could, after all, be taken by such means." In that quote is one of the most interesting nuggets about the Verdun campaign, at least in the opening phases. Falkenhayn did not believe that the capture of the actual city of Verdun was necessary for the offensive to be successful. On the other hand the Crown Prince and Knobelsdorf were aiming to take the city right from the very start and that is what they based all of their planning around in the run up to February 21st. Part of this misunderstanding was due to the fact that Falkenhayn was not precisely clear on what he wanted, it would be only later that the Crown Prince would learn of Falkenhayn's true purpose for the attacks, as he referenced in the previous quote. While there this and other disagreements between the Crown Prince and Falknehayn, the one thing that everybody could agree on was that artillery should be at the forefront of any fighting, heavy artillery would plough the road that the infantry would walk down. 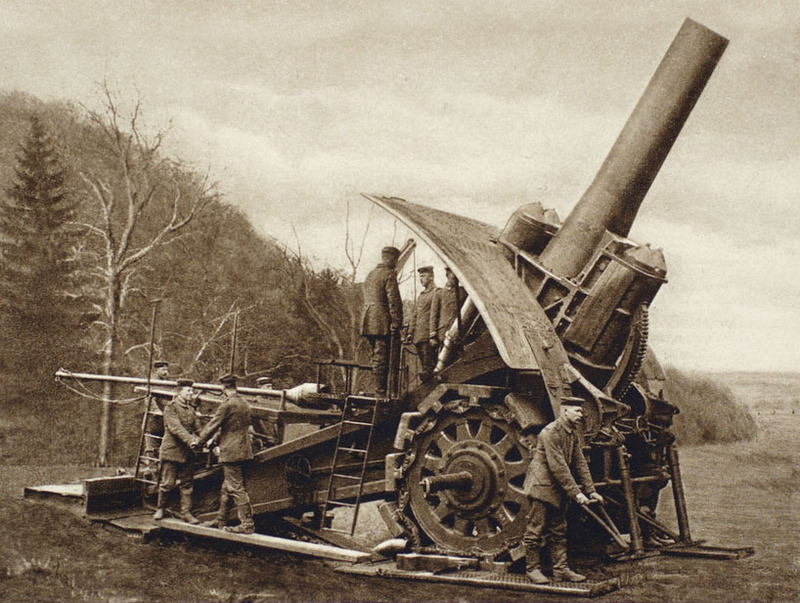 The first draft of the orders began with the words "The decision to take the fortress of Verdun in an expeditious manner rests on the proven ability of the heavy and heaviest artillery." Which is extremely unambiguous, the French would be constricted down into their little salient and the German heavy artillery would blast them away. The problems and disagreements all came into play when the discussion switched to what would happen after the artillery began firing. When the initial plan was given to Falkenhayn by the Fifth army it envisioned a quick advance all the way to the line of Fort Souville-Fort Tavannes on the east bank, but it also called for an attack on the West bank. Just a little aside here, I will try to be consistent here, but if you do any other reading you will see the area on either side of the river Meuse referred to as the east and west or left and right bank, for future reference east equals right and west equals left. The discussion between whether to attack on one bank or both banks would be the primary point of contention between Falkenhayn and the Crown Prince over the course of the planning for the attack. All of the simulations and planning from before the war insisted that it was absolutely essential to attack on both banks of the Meuse for an attack to have any hope of success. In fact, every simulation done before the war showed any attack on just one bank to be a complete failure. So this knowledge is where Knobelsdorf and the Crown Prince started their planning, but Falkenhayn was adamant that it was possible to achieve the goals of the attack by only attacking on the east bank of the river. His primary reason was that he did not have the number of forces necessary to attack on both sides, the reason for this was that he was holding back troops to take part in Phase 2 of his plan. The first of the generals on the scene was that if they did not attack both sides the French artillery on the west bank would prove to be a serious problem to any advances, in its position it could rain fire down on any German positions on the east bank, the pre-war thinking was that the only way to neutralize this threat was through an infantry advance, but Falkenhayn believed that the French guns could be silenced with only the German artillery. This decision, this very first decision in the detailed planning, would haunt the Germans for the rest of the year. The next decision, and again something that Falkenhayn and the Crown Prince disagreed on, was on what the objectives for the opening phase of the battle should be. Falkenhayn wanted limited objectives to keep the cost of the advance as light as possible, a slow and methodical movement that was constantly waiting for the artillery to clear the path. On the other hand the Fifth Army wanted to strike hard and fast and advance as far as possible after the initial bombardment had ceased. Here again looms the problems of the objectives of the Fifth Army and of Falkenhayn being out of sync. Even the wording of orders given, of written orders, were in conflict. Falkenhayn's orders said "an offensive in the Meuse area in the direction of Verdun" and the Crown Prince's said "to capture the fortress of Verdun by precipitate methods." It does not take a military historian to see how those might be interpreted differently. However, when the orders of the Fifth Army, which would now only attack on one side of the river, were submitted to Falkenhayn, with those words in them, he approved them. But why would he do that? He knew that the orders were not properly conveying his purpose. This was another very important decision that Falkenhayn made in the run up to the battle, and another mistake. It is also one of the big moments that those who dispute the Christmas letter point to as proof of their assertion, if his goal was never to take the city, when why would he approve orders with that as their stated goal. One of the possible reasons that Falkenhayn would have approved the orders, and this might be a stretch, was the impact that it would have on the morale of the German troops. It is a valid reason, soldiers like it when their goals are the capture things like the strongest fortress city in France, that is a goal worth fighting for. A goal of wearing the enemy out, maybe slightly less so. The German troops had been on the defensive so long and if they were just going to take part in another battle of attrition, which they had been fighting defensively more months, it was not going to give the men that boost that generals like to see in troops before an attack. Falkenhayn also believed that, even though the Fifth Army's orders disagreed with his own, he could still control the course of the fighting from his position using his ability to control the flow, or lack of flow, of reinforcements to Verdun. At any point if he wanted the attack to go faster, he could give it more troops, if he wanted it to slow down he could hold those troops back, or at least that was the theory. The criticism of Falkenhayn during this stage of the planning is near universal from what I have read, even from historians who generally paint him in a positive light. No matter what his goals were for the attack it was clear that the Fifth Army was not on the same page, and as the commander of the situation it is absolutely his responsibility to make sure that they were on the same page. This has caused hyperbolic quotes from historians in books about Verdun, like this one from the excellent Price of Glory "Seldom in the history of war can the commander of a great army have been so cynically deceived as was the German Crown Prince by Falkenhayn." As I said, pretty hyperbolic, but it is not a stretch to say that Falkenhayn failed, but the orders were approved on January 27th and published to the Fifth Army, the attack would happen, whatever its goals, and it was scheduled for February 12th. During December and January Falkenhayn was not just concerned with the attack at Verdun, he had bigger plans, and these bigger plans were Phase 2 of the operation for 1916. Phase 2 would start with the action of the enemy, more specifically with a French and/or British attack. By threatening Verdun Falkenhayn was convinced that the French would launch a premature attack somewhere else to relief the pressure. These would of course fail like every ever French attack and then Falkenhayn could send in the reserves to mop up the pieces. Falkenhayn believed that the attack could come in one of two places, and stop me if you have heard of these before, Artois and Champagne. If the attack came in Artois the goal would probably once again be the capture of Vimy Ridge, and because of this Falkenhayn reached out the Sixth Army to discuss the plan for the counter attack. The Sixth Army's commander, General Kuhl did not play along with Falkenhayn, at least not precisely. The first draft of his attack plan involved 12 Army corps, a force way way larger than what Falkehayn had in mind, he was thinking more like 8 divisions, not 8 Corps, 8 divisions. When Kuhl then scaled down his attack for these numbers the result was a plan that aimed to capture some small pieces of Vimy Ridge that had been lost to the French, but that was it, and this did not meet with the grandiose goals that Falkenhayn had in mind. Kuhl believed that this was all that would be possible, and he believed this so fiercely that he did not include any further projected objectives, even when they were requested. Falkenhayn thought that Kuhl should be planning a grand offensive against a broken set of French troops who had attacked too early and this is where the prime misunderstanding lay between Kuhl and Falkenhayn. Kuhl did not believe the fundamental premise of Falkenhayn's plans, that the French would attack prematurely and without proper preparations. He believed that they would wait, hold the line as best they could at Verdun, while preparing for their counter stroke. This difference of opinion, even after many discussions which continued for several months, was never rectified. Even after the British started taking over part of the line in front of Kuhl Falkenhayn did not give up on his ideas, in fact the two Generals would never come to an agreement, but it would not matter in the end with the course of Verdun and then the attack on the Somme. The other possible option for the French was an attack in Champagne, and for this option Falkenhayn contacted the Third Army. He found them not much more agreeable to his plans than Kuhl had been. They presented two conditions they believed would have to be met before any attack could be launched in Champagne. The first condition was that the location of the advance had to present an obvious tactical advantage and the second that there must be some obvious way to take this tactical advantage and roll it into larger gains. If these two conditions could not be met than it was not worth the time, according to the Third Army. There was only one place on the line where both of these conditions could be met, and that location would need a lot of additional work to dig jumping off trenches to bring the lines together before an attack could be launched. They also projected that they would need only 6 divisions for the initial attack, a number that Falkenhayn was a fan of, however, for the follow on attacks they believed they would need an additional 10 divisions, for a total of 16 additional divisions. This is where they lost Falkenhayn who wrote back and said that he was refusing this plan and demanding that one be provided that would use only a total of 8 additional divisions. According to German Strategy and the Path to Verdun the response of the 3rd army does not survive the war. However, there is some evidence that the plan drastically reduced the goals of the attack to match the reduction in troops available. After this response Falkenhayn seems to have dropped the idea of attacks in Champagne. So instead he went back to the 6th Army and Kuhl in March to see if the situation had changed, Kuhl did not believe it had. In fact, when Falkenhayn arrived in person at Kuhl's headquarters, the 6th Army's commander was confused as to why he was there so they gave him a plan to capture Arras, now being covered by British instead of French troops. Falkenhayn gave provisional go ahead for this attack, but said that the troops may not be available depending on the action at Verdun. By the end of March Falkenhayn had given up on the hope of a failed French attack that would open the door to a successful counter attack. Just a few weeks later, the 2nd Army started to report massive increases in British activity on their front, the Somme was coming. Looking at Falkenhayn's plan for Phase 2 it is so interesting to look at he juxtaposition of what he had right and wrong about the situation in 1916. He was correct in seeing that a great breakthrough offensive was not possible in an initial German attack which led to him attacking at Verdun, but his beliefs in the ability of his troops to counter attack, with such small numbers and such grandiose aims seem so completely out of touch with reality. They can only be explained by Falkenhayn believing that the French were so close to the end of their rope that they would just fall apart after a few good punches. Oh, how wrong he was. The source of the week this week is German Strategy and the Path to Verdun: Erich von Falkenhayn and the Development of Attrition 1870 - 1916 by Robert T. Foley. Last week the Source of the Week was the very approachable The Price of Glory, this week our source is less approachable. This book is packed with great information, and does a great of of analyzing that information. It also ends up reading more like a doctorate dissertation than a work designed for everybody to read. This fact makes it perfect for me as a source, but may not be the best choice for kicking back on the couch for a bit of light reading. The decisions made by Falkenhayn in late 1915 and early 1916 changed the course of the war. Understanding why he made these decisions, and his failure of properly communicating them, is important to understand why the attack at Verdun became such a debacle. This book covers all of those decisions, and all the moments when they went wrong. Next week we will continue our look at German preparations for the upcoming attack be stepping one step closer to the front to look at exactly how the Fifth Army planned to launch its attack.